We started off 2017 with a bang in January with some new Munchkin loot, and the double-sized finale of our long-running Munchkin comics produced by our friends at BOOM! Studios. So I guess we started off the year with a bang and a boom! 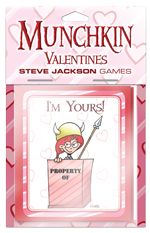 You can do that with these Munchkin Valentines! Each package comes with five valentines and envelopes, so you've got five chances to make someone like you. We believe in you! Kind of! These cards belong in a museum! 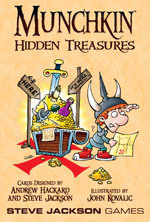 Encompassing many versions of Munchkin, you'll find cards in Hidden Treasures no matter what flavor you are into. Plus, you don't need to do any manual labor to get them; we dug them up for you in advance! *A few odd-sized cards are not included. 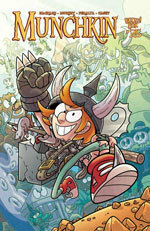 Celebrate the series finale of Munchkin comics! Look in the back pages of this issue for a special promo code to get The Official Munchkin Bookmark of the Garb of the Gazebo and five Munchkin promo cards from Warehouse 23 for a penny, plus a bonus Munchkin rule!